evoniukus	 02-23-2019 03-14-2019 Success 19 2/2 Sent 2 cards, LOR and SASE. Returned signed in blue pen. Also wrote me a letter thanking me for my kind words. Patgrealish	 12-21-2018 01-03-2019 Success 13 1/0 SASE 89 Topps. Signed, with note. Also sent small note. ???????? 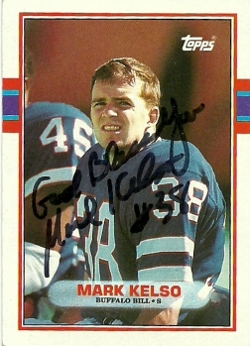 rohdefamily	 09-17-2018 09-26-2018 Success 9 2/2 Received both cards signed by Mr. Kelso. God Bless. He also wrote a very nice note back to my son and I. Thank you Mr. Kelso! RobHarrington	 06-20-2018 11-06-2018 Success 139 3/3 Signed three cards in thin blue Sharpie. CRM302	 12-02-2017 12-12-2017 Success 10 1/1 Sent 1992 Fleer. Signed my card and my note. Thank you Mr. Kelso! heffyscards	 05-13-2017 06-24-2017 Success 42 3/3 Signed 3 cards , Thanks Mark! ClevelandSports	 05-09-2017 05-17-2017 Success 8 1/2 1990 Pro Set in 8 days with a 'God Bless You' inscription! He wrote a short note as well! Thanks, Mr. Kelso! Thunderfoot	 08-22-2016 09-06-2016 Success 15 2/2 signed 92 pacific, 90 pro set, 15 days, Thanks Mark! Ebys23	 06-18-2015 07-10-2015 Success 22 2/2 90 Pro Set- personalized and god bless you inscription thnx mr. kelso!!!! Pauls1976	 04-02-2015 04-30-2015 Success 28 2/2 Huge Bills fan! LOR and SASE, 2 cards with heading of 'God Bless You'. Thank you Mr Kelso! 34BoJackson16	 11-15-2013 11-30-2013 Success 15 1/1 (1) 1981 Topps RC. Awesome return, thanks Mr. Kelso! LGBuffalo	 08-31-2013 09-14-2013 Success 14 1/1 Card signed nicely. Thanks! scBraves	 08-25-2013 09-16-2013 Success 22 1/1 91 Pro Set with his normal "God Bless You" and "#38"
Scout85autos	 02-12-2013 02-13-2019 Success 2192 2/2 He misplaced my request and apologized for the delay. Sent in 2013!!! wolfman4christ	 01-04-2013 01-17-2013 Success 13 1/1 Signed my 1988 Topps. Thanks Mark! 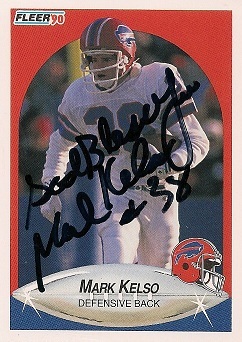 TheCardBandit	 09-28-2012 10-11-2012 Success 13 1/1 wrote in ballpoint pen w/ "God Bless You' and his #, thank you Mr Kelso!! !